Younis Khan - The Best Test Batsman Produced by Pakistan. Maybe the World. Pakistan rarely plays a Test Series where Younis Khan does not make an impact and their most recent test series against Bangladesh was no different as Younis played yet another instrumental innings to set up a Pakistan win in the second test. Pakistan's senior most batsman has been an absolute legend in Tests, something he has not been able to replicate in ODIs where he finds himself out of favor with the selectors and the public. When it comes to tests, however, Younis Khan is a giant of the game and arguably the best batsman produced by Pakistan in the format. Maybe even the world. As the Pakistan test team departs for a 3-match test series against Sri Lanka, where Younis Khan will play his 100th test (fitness permitting ofcourse), here we tell you why Younis is in fact the absolute test best! Last year, in the test series against Australia, Younis Khan became the first batsman from Pakistan to score a century against every test playing opposition. He is one of the only 12 batsmen in the world who have achieved the same feat. Younis Khan is also Pakistan's leading test centurion with 4 more centuries than the next best 25 of Inzamam Ul Haq; Younis Khan's most recent test century against Bangladesh was his 29th. Moreover, currently at third, he is only 285 runs away from becoming the leading run scorer for Pakistan in tests. While there is little doubt that he is one of the best produced by Pakistan, his performances over the years demonstrate that he is among the best in the world as well. He has performed far better than most of the modern day greats that the world media is always vocal about. In a number of ways he has given remarkable performances that out shine those of Sachin Tendulkar, Ricky Ponting, Jacques Kallis, and Rahul Dravid. Not only has Younis scored more runs than all of them after 98 tests, he has averaged more than all of them in the past decade of test cricket. Only Kumar Sangakkara averages more than Younis in tests played since 1st January 2005, and only Sangakkara and Kallis have more centuries than Younis does during this period. What is even more eye opening is that Younis has the same number of centuries as Hashim Amla does during these 10 years in 15 fewer innings. Those who are quick to call Younis good on only subcontinental wickets must be pleasantly surprised to note that Younis has scored runs all over the world and against all opposition. He is the third highest run scorer in tests played away from home; behind only Tendulkar and Dravid. 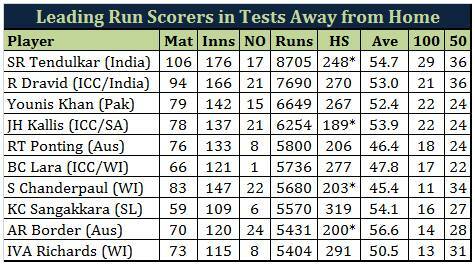 Additionally, only Tendulkar has scored more centuries away from home than Younis has. 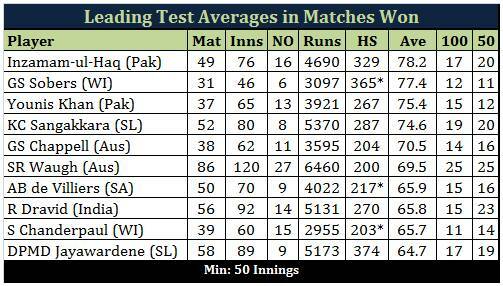 Younis is also one of the few batsmen in this world who average over 50 in tests played away from home. Sachin Tendulkar is often criticized by his own countrymen for scoring tons of runs that don't matter. Critics claim that Tendulkar hardly ever scored when it mattered and that he does not have as many match winning innings as someone like Dravid or Inzamam. There is absolutely no doubt in that statement when one takes a look at the batsmen that have the highest averages in tests won by their team. 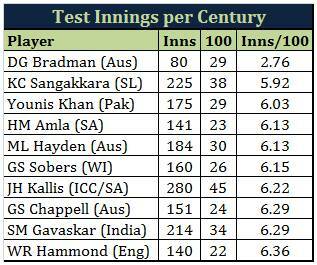 Younis Khan is right up there, over and above all, except Inzamam and Sir Gary Sobers. 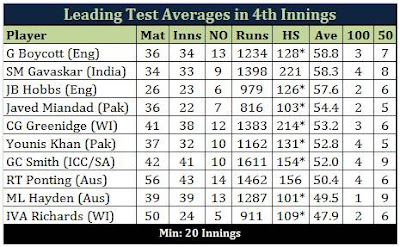 Younis has a phenomenal average of 75.4 in tests won by Pakistan and 15 of his test hundreds have come in winning causes. Younis' contribution to Pakistan's wins has been remarkable and significantly better than that of the 'popular' modern day greats that are still playing such as AB De Villiers, Hashim Amla, Micheal Clarke, and Alastair Cook. 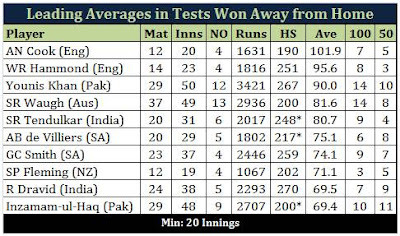 Younis has not only contributed to test wins for Pakistan, he has done so for tests won away from home as well, which has been a task and a half for subcontinent teams in the recent past. Younis is the leading run scorer in the world in tests won away from home, and his Bradmenesque average of 90 in those tests is the third best in the world, behind only two Englishmen - Cook and Wally Hammond. 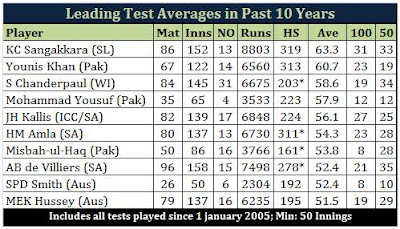 Younis also has the most centuries in tests won away from home and is equal on that front with another legend, Steve Waugh. Younis' true testament to being a batsman for all conditions comes forth in the fact that he is among the only 8 batsmen in this world who average above 50 in the 4th innings of test matches, and among the only 4 batsmen in this world who have scored 4 test centuries in 4th innings of tests. It doesn't take a genius to know that such centuries can only be match winning or match saving efforts. It is a shame that Pakistan does not play enough test cricket for if Younis Khan played as much as Tendulkar, Kallis, Ponting, Sangakkara, and other great batsmen did he would have more runs and more centuries than all of them. 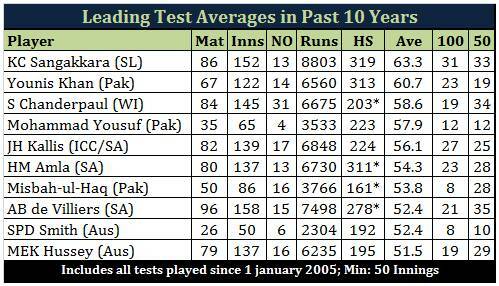 Younis has been around for 15 years and in this time he has played only 98 tests. Others like Sangakkara, Cook, KP, Graeme Smith, Clarke who debuted around the same time or after Younis have gone to play well above a 100 test matches. 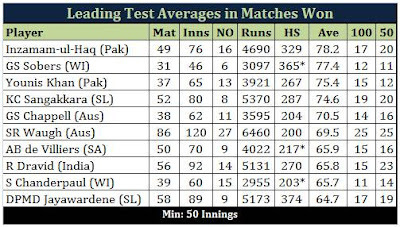 Younis' average and the number of innings he takes to score a test 100 demonstrate that he would have scored far more runs than any of the above mentioned batsmen (barring Sangakkara) had Pakistan played more tests than the other countries. So for all those who talk about Tendulkar, Dravid, Ponting, Lara, Kallis, and Sangakkara as the modern day greats and mention Cook, Clarke, KP, ABD, and Amla as the current generation of great test batsmen must not forget Younis Khan who stands over and above all these batsmen. He is a test legend no less and the best this world has seen. Fortunately for all of us, he is not done yet and his fitness levels are good enough to keep him going for some more years at least. The intangible effect that Younis Khan has had is also a feat for the great batsmen. All his captains have spoken highly of him being a true team man. While the younger generation of Pakistani batsmen have publicly praised Younis for helping the out on and off the field. Azhar Ali, Asad Shafiq, Fawad Alam, and Umar Akmal claim that Younis was the guiding force towards them scoring their first, and in some cases many more, test centuries. Younis' contribution to Pakistan's test success is nothing short of phenomenal and the man will go down in history as the best test batsman ever produced by Pakistan. So Sachin has scored tons of runs where it didn't matter! How casually you dismiss the greatness of the one of the world's greatest cricketers ever born!!! You forget longevity...maintaining an avg of 53.78 over 200 tests, 100 more than your protagonist. 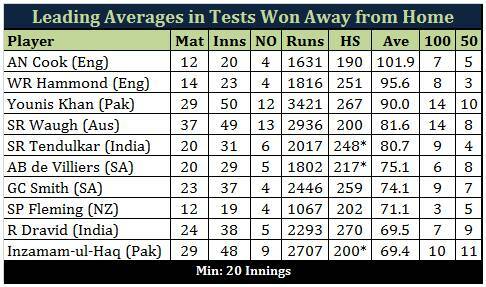 Also, Tendulkar scored 20 centuries in test wins as opposed to the 17 that Dravid did. 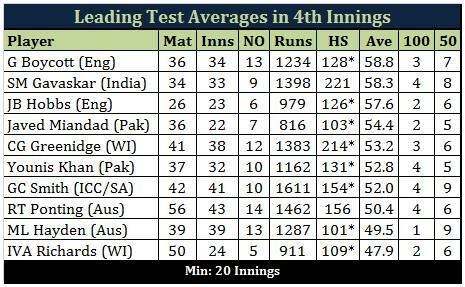 The leader in this list is Ricky Ponting -- who scored 30 centuries (in 27 matches!). I agree that Younis Khan has been a great performer but putting down THE GREAT, SACHIN TENDULKAR....is not so muchin good taste. He averages less than 45 outside Asia minus minnows. A great Pakistani batsman, but not a top tier great. And unlike someone like Lara, he never made big runs against any big bowling attacks or in big conditions. Well said. He is the most likeable Pakistani cricketer of this generation! yes Younis khan is best test player of pakistan. Monday, August 03, 2015 This comment has been removed by the author. Please update the record as Younis Khan has already scored Century No. 30 against Srilanka in June/July 2015 and breaking many more records.